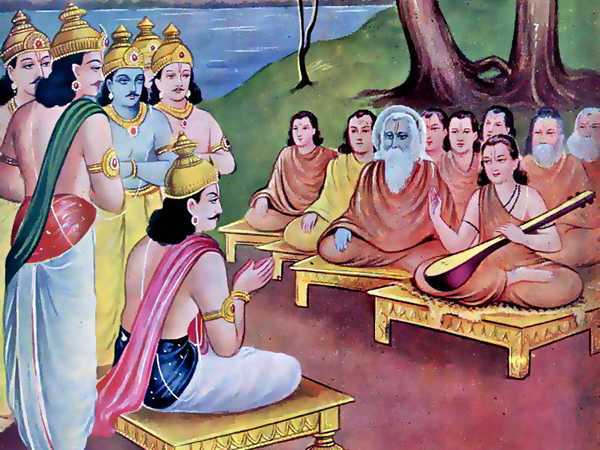 ‘”Janaka said, Thou hast, O foremost of Rishis, said that Unity is theattribute of that which is Akshara (Indestructible) and variety ormultiplicity is the attribute of what is known as Kshara (Destructible).I have not, however, clearly understood the nature of these two. Doubtsare still lurking in my mind. Ignorant men look upon the Soul as enduedwith the incident of multiplicity. They, however that are possessed ofknowledge and wisdom regard the Soul to be one and the same. I how-ever,have a very dull understanding. I am, therefore, unable to comprehend howall this can happen. The causes also that thou hast assigned for theunity and the multiplicity of Akshara and Kshara I have almost forgottenin consequence of the restlessness of my understanding. I therefore,desire to hear thee once more discourse to me on those same incidents ofunity and multiplicity, on him who is knowing, on what is destitute ofknowledge, on Jiva-soul, Knowledge, Ignorance. Akshara, Kshara, and onthe Sankhya and the Yoga systems, in detail and separately and agreeableto the truth. “‘Vasishtha said, I shall tell thee what thou askest! Listen however, tome, O monarch, as I expound to thee the practices of Yoga separately.Contemplation, which constitutes an obligatory practices with Yogins, istheir highest puissance. Those conversant with Yoga say thatContemplation is of two kinds. One is the concentration of the mind, andthe other is called Pranayama (regulation of breath). Pranayama is saidto be endued with substance; while concentration of mind is unendued withit. Excepting the three times when a man passes urine and stoolsand eats, one should devote the whole of his time to contemplation.With-drawing the senses from their objects by the aid of the mind, onepossessed of intelligence, having made oneself pure, should agreeably tothe two and twenty modes of transmitting the Prana breath, unite theJiva-soul with That which transcends the four and twentieth topic (calledIgnorance or Prakriti) which is regarded by the wise as dwelling inevery part of the body and as transcending decay and destruction. It isby means of those two and twenty methods that the Soul may always beknown, as heard by us. It is certain that this practice of Yoga is hiswhose mind is never affected by evil passions. It is not any otherperson’s. Dissociated from all attachments, abstemious in diet, andsubduing all the senses, one should fix one’s mind on the Soul, duringthe first and the last part of the night, after having, O king ofMithila, suspended the functions of the senses, quieted the mind by theunderstanding, and assumed a posture as motionless as that of a block ofstone. When men of knowledge, conversant with the rules of Yoga, becomeas fixed as a stake of wood, and as immovable as a mountain, then arethey said to be in Yoga. When one does not hear, and smell, and taste,and see; when one is not conscious of any touch; when one’s mind becomesperfectly free from every purpose; when one is not conscious of anything, when one cherishes no thought; when one becomes like a piece ofwood, then is one called by the wise to be in perfect Yoga. At such atime one shines like a lamp that burns in a place where there is no wind;at such a time one becomes freed even from one’s subtile form, andperfectly united with Brahma. When one attains to such progress, one hasno longer to ascend or to fall among intermediate beings. When personslike ourselves say that there has been a complete identification of theKnower, the Known, and K now-ledge, then is the Yogin said to behold theSupreme Soul. While in Yoga, the Supreme Soul displays itself inthe Yogin’s heart like a blazing fire, or like the bright Sun, or likethe lightning’s flame in the sky. That Supreme Soul which is Unborn andwhich is the essence of nectar, that is seen by high-souled Brahmanasendued with intelligence and wisdom and conversant with the Vedas, issubtiler than what is subtile and greater than what is great. That Soul,though dwelling in all creatures, is not seen by them. The creator of theworlds, He is seen only by a person endued with wealth of intelligencewhen aided by the lamp of the mind. He dwells on the other share of thickDarkness and transcends him called Iswara. Persons conversant withthe Vedas and endued with omniscience call Him the dispeller of Darkness,stainless, transcending Darkness, without attributes and endued therewith.